For three weeks, I made sure to EAT my way through the Safeway ice cream and junk food aisles. My snacks of choice were It’s-It, ice cream sandwiches, Dib's, rocky road, Cheez-Its, Rice Crispy Treats, Eggo Waffles, Coffee Cakes, Ring Dings. Oh la la, I am so grossed that I ate all that. Anyway, now that I’m home, I PRAY that I can lose the weight I gained stuffing my face with junk food that I can’t find in France. Did I mention I LOVEd my American vacation? It was beaucoup trop short. Big Fry: Why does everyone say “hello” in America mommy? 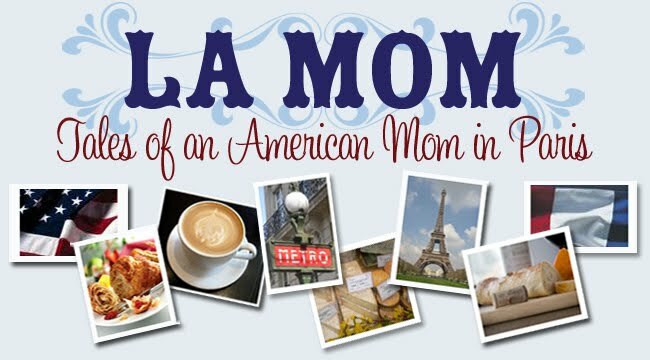 La Mom: Because Americans are so friendly sweetie. (Sidebar: Big points go to my Big Fry for noticing at such a young age that Americans are friendlier than the French). Small Fry: The toilet in America is bigger and has more water than our toilet in Paris. Why mommy? La Mom: Super-sized diets require super-sized toilets ma puce. Customs Agent: Welcome home La Mom! How are you today? La Mom: (so overcome with emotion that I burst into tears) It’s so good to be home and to be welcomed with a smile. You have no idea how wonderful it is. La Mom pleads guilty to putting her Small Fry on display and showing off un petit peu. Women: Awww. She's adorable and so lucky to be bilingual at such a young age. Big Fry: Mommy, why is everything so big in America? Big Fry: Like trucks, cars, donuts, ice cream cones, hamburgers, houses. La Mom: Americans like big things. Small Fry: I want Vache Qui Rit cheese. Big Fry: We aren't in France anymore. They don't have this cheese in America. La Mom: Honey, you can get anything you want in America. You can be anything you want to be in America. And yes, there is Laughing Cow cheese in America too. We just have to find it. Small Fry: Where is the dou dou of baby Scott? Foxy Mommy: The doo doo of baby Scott? Small Fry: (louder) Where is the dou dou of baby Scott? Foxy Mommy: Do you mean his poo-poo? Maybe he has poo-poo in his diaper. Small Fry: (louder again) No, where is the dou dou of baby Scott? Foxy Mommy: What's a doo doo? Small Fry: (screaming to be understood) The dou dou of baby Scott! Big Fry: It' something baby Scott sleeps with. Foxy Mommy: (finally getting it) Oh, you mean a lovey?! He doesn’t have one yet. Yummy Mummy: Small Fry keeps saying she wants a doo doo and doe doe. She can’t tell me what a doo doo or doe doe is in English. So I just checked if she went doo doo in her underwear. She didn't. What is she talking about? She’s crying for doo doo. La Mom: Dou Dou is her lovey and I forgot it at home. Do-do is bedtime or night-night. Just give her any stuffed animal and tell her it’s her special dou dou for do-do tonight. She’ll be fine. Yummy Mummy: I thought French was a beautiful language. This doo doo/doe-doe stuff sure sounds dirty. Milles mercis go to everyone who commented, sent emails, and tweeted about sending La Mom copies of the July EasyJet in-flight magazine I was quoted in. I owe you all a box of macarons! So much doo doo, and so early in the day! I'm coming over all funny! P.S. Interesting sociological observation about the size of American toilets (vs. French ones) - I always thought it was somehow related to median bottom size. More study of this interesting subject is required, I feel? Hello La Mome, I always laugh so bad when I read you're articles! I just had my baby a couple of months ago, & my mom was here for the birth & since our native language is not french, I can relate to the how funny do-do & dou-dou sound off the french context. My mom just didn't understand why my husband kept hushing the baby to sleep & asking her to make do-do at the same time!!! Yo are right, baby-french sounds very hilarious sometimes. Sbtttttt! I am dying over the "we get to sit next to the kid with a poopy diaper!" So glad that "y'all" had a trip home to indulge in what "home" has to offer and yet ready to get back to the life you have made in Paris. love your account of your trip, thanks for the great dou dou story and small fry comments. precious and geniale. Fun times. Vacationing with kids is quite an event. Sounds like a great vacation La Mom! and I LOVE hearing all about it, the doo doo included. Kids say the darndest things. Hat's off for showing of so smoothly. I'm going to try that. We say do-do too for sleep! And we live in Asia. You are hilarious. Don't worry about the weight, I'm sure all that laughing will work it off. LOL! Seriously, I am cracking up. The last line about the man's comment on the plane sent me over the edge with laughter. I can only hope that I can trade my expat in Dubai status with an expat in Paris status so my kids too can learn the in's and out's of do do and dou dou. Thanks for making me laugh this morning. HAHAHA!While I certainly feel sad for your little fry, I laughed so hard! Dou-dou, indeed! Too funny! Hi La Mom ! I am French and lived in the US for a year, though I'm now back in Paris. Knowing and loving both cultures, I really enjoy reading your texts. I think you have a lot of humor and I understand completely some of the situations you are describing. I have been sometimes in situations of "choc culturel" too !!! Loved it, made me laugh. I'm also a bilingual mum of 2 and sometimes we really enjoy teasing both Brits and French, switching from one language to the other. Glad you had a nice time back home! I'm an American living in Australian who just happened to find your blog while searching for information about France. Your blog is Fabulous! Your story had laughing so hard I had to share your story with my other half.